Maragondon, Cavite—Rogel Sorel, 47, has been a rice farmer for quite some time now. He has tried both inbred and hybrid rice varieties, experiencing the pros and cons of using each one. As of late, however, he has seen the benefits of an early maturing variety known as Quadro Alas. Farmer Rogel Sorel shows off his recent crop of Quadro Alas rice. Under the Hybrid Rice Model Farm Program of the Department of Agriculture, Rogel’s farm was chosen to try this variety. He has seen its advantages over other kinds of rice crops. For farmers like Rogel, using Quadro Alas equates to less “stress,” such as exposure to disease and drought during the dry season. Moreover, they can earn more, as farmers can plant and harvest more times in a year. To put things into perspective, regular rice varieties usually take 120 days to mature, as opposed to 105 days for Quadro Alas rice. Rogel began planting Quadro Alas on his two-hectare patch in Barangay San Miguel A, Maragondon last Oct. 3, 2018. 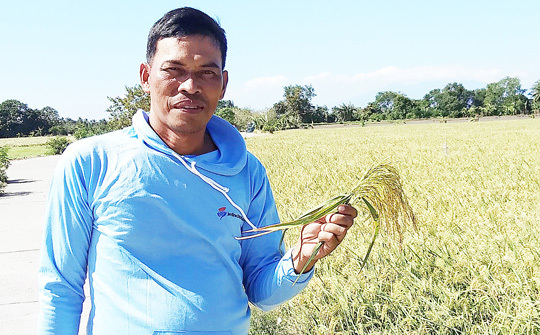 He harvested his rice crop on January 15. Apart from the early maturity, Quadro Alas produced a higher yield of about 37 percent vis-à-vis other rice varieties. “The Quadro Alas rice variety seems a lot better. You can harvest early and even earn more with its larger yield,” Rogel said. The long grain of Quadro Alas has high milling recovery and excellent tolerance to bacterial leaf blight (BLB) and bacterial leaf strain (BLS). While it was planted in Cavite under the watchful eyes of Municipal Agriculturist Teresita Nuestro, DA Technician Regino Reyes, and the Hybrid Rice Model Farm Program of the Regional Field Office 4A headed by Regional Executive Director Arnel Mesa, it can be planted in such areas as Ilocos, Samar, Leyte, and Negros. All these ties in with the Department of Agriculture’s call for farmers to use rice varieties that mature early thus would use less water. This is ideal for the summer season when rice crops are more prone to stressful conditions, including the lack of water.